This prolific plant grows in Europe, North America, and Asia. A number of species are used as garden ornamentals. The flowering tops of yarrow are used in herbal medicine. Yarrow has traditionally been thought to stimulate absent or diminished menses, though it has not been studied clinically. Yarrow is a gas-relieving herb used in traditional medicine to treat colic. It is generally given by healthcare professionals as teas or decoctions to the infant. 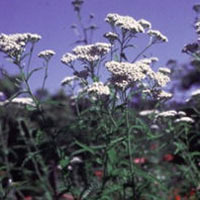 Yarrow is a diaphoretic herb that has been used for relief of sore throats. Yarrow is an anti-inflammatory herb historically recommended by doctors for people with Crohn’s disease. Yarrow is a digestive stimulant widely used in traditional medicine in North America. Traditional herbal medicine in Europe, China, and India has used yarrow to to treat inflammation in a number of conditions, especially in the intestinal and female reproductive tracts. Based on anecdotal evidence, yarrow tea may be beneficial when the main symptom of PMS is spastic pain. Yarrow is an anti-inflammatory and soothing herb that may be effective in the treatment of ulcerative colitis.